You may feel that your BMW has lever action that is too spongy and which gets worse the further you ride. Fitting a pair of mini-6s is usually the end to this problem, and gives you more powerful progressive braking. Give the ABS on your BMW a busier life, fit our calipers and really make it work! Something different, better, British, for Triumph? We can provide it! A Guzzi Le Mans with brakes? Can be done! 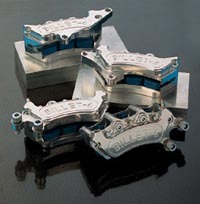 Below you can see the European assortment of BILLET Brakes. From the top, Mini 6 for BMW R80G/S, Mini 6 for Triumph Thunderbird and Adventurer, a pair of Mini 6s to replace Brembo type calipers with 40mm mounts. On the right you can see our mini-6s on a Triumph T509 and a Ducati 916.